I made this crocheted wallet to hold my store coupons and Canadian Tire money (a store loyalty coupon that looks like currency). It’s also a good size to hold eye glasses, although I would sew a soft fabric liner inside to prevent the arms of glasses from poking through the stitches. Because the pattern is simple in design, and constructed entirely of single crochet, it’s easy to adjust the size of this small bag to make sturdy crocheted flap-closure bags that are suitable for other purposes as well. Just add more stitches to the foundation chain to increase the length, and add more rows to increase the height. 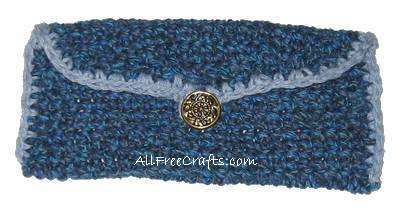 If you’d like to make a similar purse, see Crocheted Flap Purse for a free pattern. sc (single crochet); Ch (chain); st (stitches); yo (yarn over hook). Ch. 29 in main color. Row 2 to 31: Ch 1, turn, sc in each sc across the row. To decrease for the flap, insert hook in sc and pull through a loop, leaving 2 loops on hook. Insert hook through next sc and pull through a loop, yarn over hook, and draw through all 3 loops on hook. Row 32: Decrease over first two sc, and decrease through next two sc, sc in each sc across until there are four sc remaining on row, decrease over next 2 sc, then over last 2 sc. Ch 1, turn. Remaining Rows: Repeat row 32 until only 2 sc remain. Ch 1, slip stitch in second sc, fasten off. Edging: Be sure to work the edging so that chain edge is consistently on the right side. To do this, right side facing you, attach edging color to end of Row 31, ch 1, and sc evenly to the middle point of the flap. Ch 7, sl st in same sc, sc to other end of Row 31 Fasten off. Fold bottom edge of wallet up to Row 31, where flap begins. Right side facing you, attach edging color yarn to the bottom right hand corner and sc evenly through both edges of wallet until you reach the front top edge. Proceed with sc across the top edge row to the other side; sc through both layers as before, working evenly down to the bottom corner. Fasten off. With needle and sewing thread, sew button to middle front of wallet, just beneath the centre loop of chain stitches. If desired, cut one or two pieces of thin cardboard to fit inside the wallet; use these as dividers to keep your coupons or store money flat and organized.